It's no secret that I big puffy heart fabric. a new line comes out. A new line that calls to me. A new line that I fall in love with. But I love you, and so does Stephanie of Material Gal Fabric. I'm sure you will love her too. Hello "Joy's Hope" fellow readers! I'm Stephanie, owner of Material Gal. I'm a mommy, a wife, and a fabric lover - just like all of you! I started this fabric shop on etsy because it's something I absolutely LOVE! Offering beautiful designer fabrics to all of the amazing talent on etsy, and then being able to see all of the beautiful creations is the reason I do this. This week I am giving away a "Heart" Fat Quarter Bundle, from Amy Butler's LOVE Collection to one lucky reader. In addition, I will also be offering "Joy's Hope" readers 5% off of your entire purchase in my shop all week long (until Friday, November 6th). Enter the following code in "notes to seller" in order to receive your discount: JH5PCT. Custom orders are also welcome and included in this sale! Hope to *see* you all soon, and happy sewing! Seriously, how much do you love her? Giving away a bundle of fabric and a discount as well? How can you win some Love? Come back and tell me your favorite print. While you are there, be sure to heart her sweet shop. 2. Follow Material Gal on Twitter. 3. Tell me what you would make with the lovely bundle. you get an extra entry. Just let me know. I might keep you accountable! chosen on Friday November 6th. My favorite? I visited her shop, but I love EVERYTHING! I can not choose. LOL! Ok you totally got me on this one- I WANT TO WIN. It would be a great bday present (the 3rd, because I know you want to know :). I went to the shop & hearted it. I don't know how Stephanie gets a darn thing done- I would just stare at that fabric all day long! My favorite would have to be the Patty Young Flora & Fauna in turquoise. Red, white, aqua and birds? Holla. I now willingly follow on Twitter. What would I do with it? Hmmmm....I could sew a cute patchy skirt for me or the Jules in my life. I could make a cute banner. Or some fun hair things. Table runner? Necklace? The real truth is I would probably just stare at it and not want to use it because it's too pretty. Just being real. For some reason my favorite is the Michael Miller White Tweet Fabric and I have no idea why - I'm totally NOT a bird person, but that fabric is too cute! I would use the fabric to make a quilt top (I've only done one so far and am loving it)! Please stop the giveaway now...please just pick me!! please!! I really like the selection she has, wide range, lovely bits of different lines. I think Michael Miller, Lava Flowers in Aqua is my current favorite, excluding the LOVE collection. seriously, please pick me. I would either make a quilt with the LOVE or fabric garland which is my current obsession. please! I am now following on Twitter.....Tweet, Tweet! Hmmmmmm, what to make? Maybe a purse. I love the Alexander Henry Fashionista fabric! I've never seen it before! I love the new Riley Blake fabrics! oh my goodness...how do you pick just one thing?! i want it all, lol! love the timeless treasure apple bundle, all the amy butler fabric, the patterns...oh my! I've been wanting to learn how to make a zipped pouch...am I brave enough? 'Cause this fabric would be great! I luv everything but my fave is Amy Butler (Love) Pink Bali Gate! And I would make pillows for bedroom, or a dress for my daughter. I would love to see some messy flowers made w/Amy Butler Love collection!! hint..hint.. I think I would make a cute little dress for my future baby! How fun! I like Alexander Henry, Fashionista - Otranto in Sage and I also like too many of the Michael Miller fabrics to list! My favorite fabric from the store...this is a hard one....I'm going to go with Ivory Arabesque. It's just beautiful! That material is just screaming to be made into a bag! I'd love to get it and play with it! I think I would use the bundle to make coffee cozies and gadget cozies for our etsy shop. Thanks for the fun giveaway! My sister and I love your blog! My favorite in her shop, Riley Blake's Floral in Cream ... love those little birds hidden in the print :). And I heart her shop now! You get the idea :). It is absolutely IMPOSSIBLE to choose only one thing from her shop!! It's all so cute! I like the tree pattern from the timeless treasures collection! I visited Material Gal's shop. Loved Michael Miller's Fridge Art in Multi. I've been appliquing baby onesies. I would so use the material for these! I don't sew. I got a sewing machine last year for Christmas and it's still in the box. I love everything her store (too hard to pick) but if I won I promise I would break out my Christmas present 08 and give it a good try! :) And I'd be open to suggestions on what a beginner (who's quite intimidated) should make! Fave? 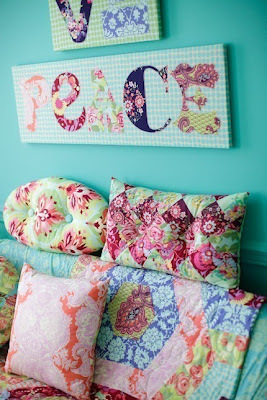 I have been eyeing Amy's newest line and have to say that I heart the periwinkle sandlewood home deco fabric. What a pretty photo backdrop it would make! I just had a tragic use of Kaffe dots. BOOOO! made a skirt too short for my girlie. Would love to re-try it longer! I would like to try to make one of those patchwork twirly skirts if I won this giveaway. (much longer this time though!) Haha. Ooh, loving the new mint paradise garden! I like the Michael Miller, Fridge Art in Multi. Lots of great fabrics though! I think I'd make a purse for my friends birthday and maybe a skirt. Thanks! I love the "Dance with Me" fabric...so patchy looking! I would (try to) make a pennant banner for my daughter's room. I am turning 26 in two weeks and am working on my "26 things to do before I am 27" list (like Megan D.)and I promise to put on there that I WILL learn how to sew! I have a brand new sewing machine still in the box from last Christmas...ugh...I know right?!? Love all the fabric but my fav is definately Rhiley Blake Be Merry Bundle. Not sure exactly what I'd make but trying for a homemade Christmas this year and would love to use these fabrics. What wouldnt I make with this bundle... hmm it would probably turn into a tote.. I have crazy love for Mint Paradise Garden! I am working to make hand-made Christmas gift for several friends, some of which are cosmetic bags! I think this fabric would be fabulous for this project! I am a very beginner level quilter, but have had more then my fair share of sewing mishaps! I follow on Twitter as well! Thanks for the chance to win! How do you choose a favorite? This NEW -- ModKid Boutique Sewing Pattern -- JULIA by Patty Young, Free Shipping Offer is adorable and would look oh so chic in any of those fabrics!! I love Amy Butler!!! LOVE!! I would make a baby quilt! YUM. I would have to make something like the NEW -- ModKid Boutique Sewing Pattern -- JULIA by Patty Young, skirt for the wee one! Went to the shop. I adore Ivory Sandlewood. It's just beautiful! My favorite was Amy Butler Belle Coriander in blue but it was hard because there was so much gorgeous stuff there!! A lot of different things! lol that orange dot fabric would be awesome to make stuff with for my little guy and the rest for my girls! If I have to pick a favorite... pink tumble roses. Love how it's so vintage-y. It's my mom's birthday coming up, so I might make her a skirt. :) Hope I win! my fave is Michael Miller Messy Hands Lively Letters in Multi...that and quite a few others, too! LOVE IT! 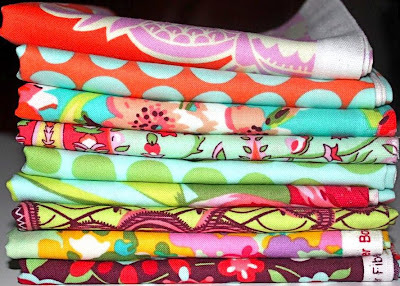 I'm a fabric addict, although I am deprived, and I cannot pick a favorite in her shop! I LITERALLY love everything! I would make something for my daughter...maybe make a small purse or something? I'm new to the sewing thing and haven't had much success. I really love the Studio Flourish Medallion in Orange. 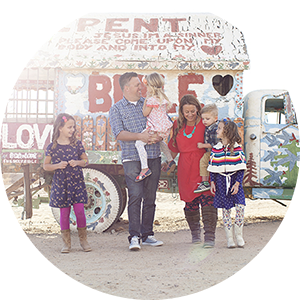 My favorite LOVE pattern is the orange and blue dots she has on your blog, but I couldn't find it in her shop. If I won some yummy fabric, I would have my mom in law make me pillows. I'm sewing challenged. Can you do a how-to blog on making those LOVE and PEACE signs? Pretty please? I (heart) Mint Paradise Garden!! I loved the LOVE collection, but I am such a fabric addict that it might be too difficult to choose, Thanks for the wonderful giveaway!!!! What a great shop! My favorite is Patty Young - Flora and Fauna, Blossoms in Turquoise. yummy!!! it all looks so delicious. but if i had to chose one it would be ivory sandlewood. and a little girls dress comes to mind. maybe a top. or a skirt for a pre-teen, a book cover . . . I would make my daughter a dress out of the fabric. It would be my first attempt at sewing clothes! I would probably make a dress for my little girl!!! Timeless treasures the owls is so cute- but really she has a wonderful selection- Nice shop! I'd make a quilt with this cute fabric! 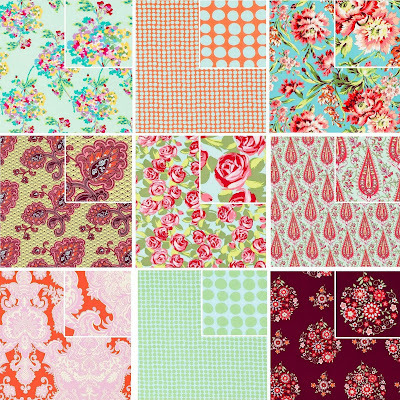 I absolutely adore the new Amy Butler Love fabrics!!! My favorite is Momento. I love her shop, I've had her added to my hearts for a while now. Love all her fabric sets, ooh la la yummy! LOL!!! I am attempting to make a coat for my wee daughter and it is NOT going well. I forgot that with corduroy you have to make sure all the pattern pieces are going the same direction because of the nap of the fabric. GRRRRR. . .No worries though, I will conquer. I love it all, but I'm all about Christmas already so I love the Riley Blake Be Merry Christmas bundle. I would love to make some pillows with the bundle! I love the Good Earth, You and Me in Pool fabric. I live overseas and it's perfect for me! I would love to make a cute skirt out of this for my daughter! I love the new AB Mint Paradise. But I also love Michael Miller for my little boy! Following her on twitter (and etsy)! I would use a bundle on my appliqué t-shirts and bags that I make for birthday/christmas gifts...probably time to get started! Oh, why do they make such fabulous fabric? Just when I am trying to not buy anything. Hmmm, what would I make with this???? maybe some cute little bags or zipper pouches with a fun flower on front, or fun hair accessories or I don't know, but definatly something awesome and great. Beautiful fabric and yes, this girl is awesome! At first I wasn't thrilled with this line, but the more I see it, the more I like it. As for this shop OMG I can't just pick one. I found the Michael Miller Messy Hands, 3 Half Yards Bundle and stopped looking - it'd be a great start to a quilt for my DD. With the love bundle I think I'd work on some items for a big girl room for my girly, or keep them all to myself for a quilt in the master, but then again I also like the pillows and wall hangings in the example photos that came with the line... needless to say I have no idea but it'd be fun to play with. Rainbow bright for sure! I just got a new pattern for summer skirts that I would love to use this fabric for! My 2 girls would look awesome in those colors! You want me to pick ONE? Okay... I'll pick grass sunspots. But tomorrow it might be something different :-). I would make something fabulous. A skirt for my daughter. Or a nursing blanket for a friend. Or a purse. I can't decide. I love the Anna Maria Horner, Garden Party, Tablecloth in Brown print! I think I would go with the tablecloth and matching runner. I love them all, but I especially love all the TIMELESS TREASURES fabrics! Soooo cute! I could make a quilt, or a bag, or a camera strap for my new camera, or a clutch purse, or an apron....did you want me to keep going??? Riley Blake, Bloom and Grow by My Minds Eye is my favorite! I love it. I would be making aprons and bibs!!! So hard to choose my favorite but I am loving the berry mix bundle. I think i would make some fabric necklaces that I have been wanting to try or some zippered pouches for christmas gifts. Please keep me accountable...the one and only piece of clothing I have ever tried to make for myself (and the only pattern I have ever used) is still laying half done tucked in the bottom of a bin somewhere. I gave up on it long ago and have never tried anything for myself since then. But I have an idea for a new outfit I want to try...I just need to get over my fear and do it. It can't possibly be worse than my first attempt. I am loving the "Love Brights" fat stack from AB. I love so many of them I cannot choose one! I do love all of the Amy Butler! I do not have a clue what I would make because I cannot sew...however I have a fabric addiction!!! OK I will go with the Michael Miller White Tweet Fabric because i have wanted some of that for freaking ever! I would make . . . toss pillows, wall hangings, stuffies (birdies and owlies and bunny rabbits) - umm, easy stuff! Because I'm a beginner! I am mostly a hand sew-er and have that pretty down-pat (been doing it since I was 5) but the big scary sewing machine on my dining room table scares me a little bit. I have made one thing on it so far. With help. From a much more experienced relative. I have a hard time with the foot pedal, to be honest. The hand-eye coordination is a challenge all by itself but then i have to use my FOOT too? (And no I don't drive, so hush!) So ummm - I guess i'm kind of a nervous/hesitant sew-er. IT'S KILLING ME! I have all these fab ideas and cute things i want to make swimming around inside my head. I think I need a sewing intervention. I think you may have pulled me into your addiction! Um, all of them. I share your love of all things fabric. I guess, if I have to pick, I'll say Alexander Henry, Fashionista - Luca in Aubergine, 1 yard . I would definitely make something cute for my little girls. Skirts or dresses. Very hard tp pick just one because all of her prints are beautiful,and I would love to win any of her fabrics. I just took my 1st sewing class last week and I also took my first quilting class too...all I need is fabric! Oh so heartin over Art Gallery - Alhambra II, Moorish Blooms in Purple, if Jellybean is a girl these are the colors I am going to use! Love the NEW - Amy Butler LOVE, Burgundy Memento. I would make a purse for my daughter. The last time I sewed anything I was a kid. I really would love to sew something. My favorite... hard to choose but I do like Michael Miller Lava Flower in Brite. I also followed her on Twitter - sjarnagin. I can't pick just one thing because I love it all!! I have no idea what I would make. I'm not very good at sewing and don't have much experience... I'll have to think about it. I'm totally horrible at sewing-even straight lines! Even though I am getting better. I attempted to sew curtains for my kitchen and bathroom. They are very uneven, but I don't really care- they are hanging up. Oh I love that fabric. I'm going to learn to sew soon. It's on my 2010 list, I promise! My favorite has to be The Amy Butler LOVE- Periwinkle Sandlewood! Love it! If I won I'd make dresses or skirts for my daughters, and aprons for myself and my sister! I think I would make some little softies, or maybe a skirt for my DD. I love the Ivory Sandalwood print! For a while I think I would just stare at the lovely fabric and enjoy it and then I would love to make a buttercup handbag. I love the Paris Bebe, Shabby Rose Bundle! I am going to be a first time grandma in the spring and it's a girl! This would be perfect! I like Art Gallery - Alhambra II, Moorish Blooms in Purple the best! I would probably make a quilt with the bundle. I am really loving the Kiwi Collection from Timeless Treasure! I love in In Love with Brights!! I would love to try to sew a pillow case dress from my daughter. Never mand clothes before - why not right? I think the material would make a cute little patchwork skirt for my baby niece...or a camera strap cover. I've never sewn before. Seriously. I have a machine. It stays in the basement. I'd love to get it out. Seriously, what is wrong with you telling people to go look at her shop! Esp when they have fabric additions like you do, but have no money! I couldn't tell you my favorite thing as I had to cut my visit short, but I saw lots of favorites on the front page!!! Not sure what I would make. Maybe incorporate them into a quilt. I'm into the whole quilting thing now. Oh and I follow her on Twitter. I'm thinking it might be a dangerous follow. I like the Erin McMorris prints. I've never seen this line before. I would probably make my daughter a quilt or maybe something for me. *Very* tough to choose a fave, but I love the tumble roses. That new line is fabulous. Those roses are just begging me to make them into a pretty spring skirt for Avery. Or maybe part of another quilt? Hmmm. Fun giveaway. Thanks, Material Girl & Julie! Totally following the material gals twitter! I LOVE the Alexander Henry pattern Fashionista . . .
And I LOVE all her stuff . . . so so cute! ps - I hearted her shop! You really want us to pick just one?? Nearly impossible. I love Bloom and Grow by My Minds Eye - Floral in Cream by Riley Blake. Really, I love it all- thanks for introducing us to such a cute shop! Oh my, it is almost impossible to choose! They are all so beautiful! One of my favorites is Studio e - Flourish Floral in Brown. This is awesome and thanks for the introduction to her site! I think I would have to use it for a quilt. They are just too pretty together! Thanks again! I love the new Alexander Henry Good Earth fabrics-so cute!! I love the Michael Miller White Tweet Fabric! If I won the bundle I would make lots of ID/cell phone/change purses for my friends! Surely you gest....it's not possible to pick just one!! I would love to make some cute skirts for my 3 girls using Riley Blake Be Merry Christmas Trees in Cream! i like the wallflower in green...even though it's not new. and i would use it to add onto shirts - add letters or number to the front of shirts. I love them ALL but especially the Rainbow Brite Bundle!! This is such a fun,great giveaway!! I now follow her on Twitter(sarahbelle528). Love the Paula Prass Party Mix Bundle. I would make a baby quilt. I love sewing them.